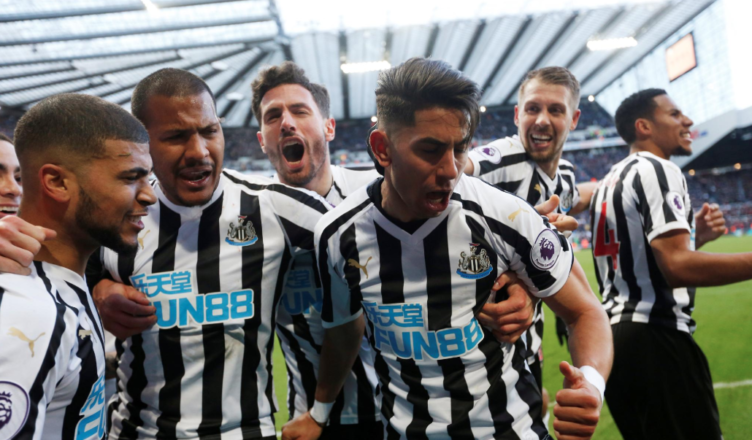 Newcastle 3-2 Everton: Incredible scenes at SJP after stunning second half comeback – NUFC blog – Newcastle United blog – NUFC Fixtures, News and Forum. 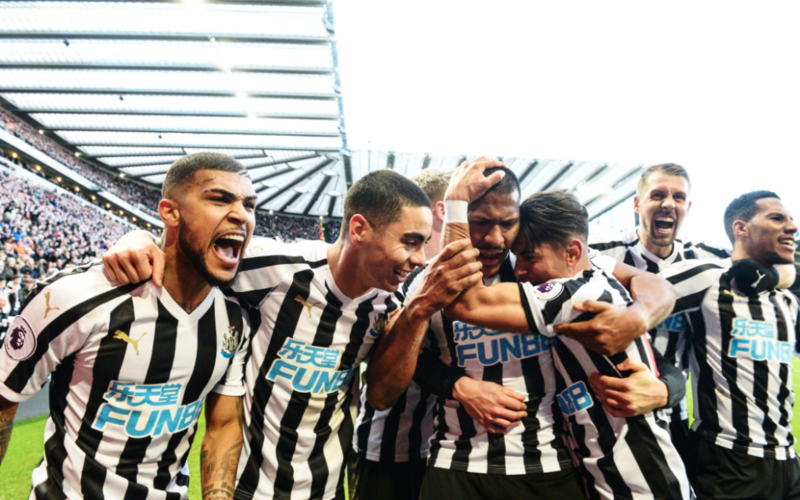 A fifth successive Premier League home win and one of the most memorable second halves I’ve witnessed at St James’ Park. At half time we went in 0-2 down, with Pickford saving a penalty after coming away unpunished following a blatant rugby tackle on Salomon Rondon. It was looking like one of those days to forget, with the referee giving us nothing and several players underperforming, but the 45 minutes that followed were absolutely magical. Perez notched two goals and an impressive assist, with Rondon also powering a brilliant volley past Jordan Pickford – although you could argue this was one of two shots that went through ‘England’s number 1’. It’s a result that puts us closer to West Ham in 9th than we now are to the drop zone, with the lads showing incredible spirit and determination to topple a Toffees side that folded like a pack of cards from the moment Rondon pulled one back. Elsewhere, Cardiff pulled off a huge home win over West Ham, Southampton came from behind to beat Spurs at St Mary’s and Brighton also got a huge 3 points away to Crystal Palace – with all three results emphasising what a massive win this was for us today. It’s safe to say we’ll all enjoy Match of the Day tonight! My worry is Rafa going 4-2-3-1 again and switching Ritchie to the right again. It doesn’t really work unless we are completely on top. Ritchie tends to get caught up in defensive duties when he is played as a right winger and him and Yedlin don’t seem to have much of an understanding. Then one of the 2 centrebacks has to cover and it pulls the team apart. Please don’t play this formation Rafa. Eric – you’re preferring Manquillo to Yedlin. Is that in general or just this one? I prefer Yedlin myself. I also expect Lascelles to be fit so the only change I’d make is Shelvey back in for Ki. Don’t know what to make of all this Beardsley stuff. I’ve met him a couple of times and he seemed a genuine good guy but something’s definitely gone wrong with the kids. I’ve watched the extended highlights on the club website a couple of times and that was one strange game. There was so much going wrong on the pitch and most of it was the officials fault. Throw ins given the wrong way continuously, sending off denied, offsides not given. Luck definitely went our way but in many ways we deserved it. Thanks Mr Pickford. georgio: I was trying to predict the team Rafa would go with and he has gone with Manquillo when he wanted a stronger defense. Unless lascelles trains all week I think he will be saved because of the international break. If he is fit I think he will play in the middle with maybe Lejeune on the right of the back 3. I agree with you about Beardsley. It is tough to know what to make of it but there is something there. Even though NUFC have mishandled this I still don’t want the FA involved. That can only be bad for the club especially since the FA are usually totally incompetent. They hired Mr. Roy and Big Fat Sam and so far have got lucky with Southgate who was totally unqualified. I trust them as far as I can throw them, especially when they get the lawyers and suits involved. I am 50/50 Rafa staying now. I didn’t see the return of Zidane which has blocked Poch’s exit from Spurs. Now I think Poch will stay another year unless Juve or PSG come calling. Anywhere else is sideways if you believe Pep is staying at City. There would be a riot if Chelsea poached Poch. So there is nowhere really for Rafa to go with the Leicester job taken. There will be money if Ashley wants to release it as I think he has just about paid his loan back. The fact that we got a loan for Almiron from Barclays tells you Fatty has been paying himself back. If I was Rafa I would ask for a rolling 1 year deal like the one Sir Bobby had. Something will open up next year and if Ashley doesn’t keep his promises then Rafa will be free to walk. The Perez numbers are interesting and it is another example of some NUFC fans not seeing the bigger picture (again I stress not on here). It should have been obvious that Rafa had asked Ayoze to do a job of defending from the front, especially against the better teams. Just like last season when Kenedy was playing well, Perez is now getting into more attacking positions as he has been freed up in the system. Hopefully he will get a few more goals because I think he averages about 1 in 5. I would also like to see Muto given a chance to see what we bought. It would be nice to have a decent lead in a couple of games and experiment a bit. I mean, we didn’t know what we had in Ki or Longstaff until injuries forced Rafa’s hand a bit. I don’t actually blame Rafa for being so conservative because he knew every point would count. I just got very bored with some of our football. We all did Eric especially pre xmas. Seems to me the Almiron signing has made a significant difference. He hasn’t scored yet but definitely adds weight and options for us up front. It is notable in the last two games that his blistering pace isn’t burning off PL defenders like it did in the MLS. There’s some super fit, athletic and fast players in the PL. Great signing though with a lot more to come. Aaron’s seems to be doing well on his loan at Shef Wed.
Is that his level or does he just need regular football and focus on playing his football to achieve his true potential? Are his chances at NUFC over or is there a way back for him – especially considering Kenedy hasn’t been great on that left side for us. Aarons in place of Atsu and/or Kenedy. Groucho: Aarons in place of Atsu and/or Kenedy. I forgot about Atsu, aye he’s not pulled up any trees either has he?!. Rafa seems a stubborn old goat though and if Aaron’s has gone too far down the line, there may be no way back for him. I would like to hope there is though. Just read that Slimani has scored 1 goal in 15 games on loan in Turkey. I think Leicester wanted 20 million for him. I think we dodged a bullet there but it shows once again how mad the transfer market is because he cost them 30 million. Sharpy17: I forgot about Atsu, aye he’s not pulled up any trees either has he?!. There’s a few we could offload to a promotion seeking Championship club. Atsu because he has no end product. Gayle, obviously. Clark, even though I don’t think he has done anything wrong. Aarons and Manquillo. The problem is will Ashley release the funds that we get from any sales? I mean, there is no point in depleting the squad if you don’t get replacements. On the subject of Hayden, I think he might change his mind. He better be careful what he wishes for. 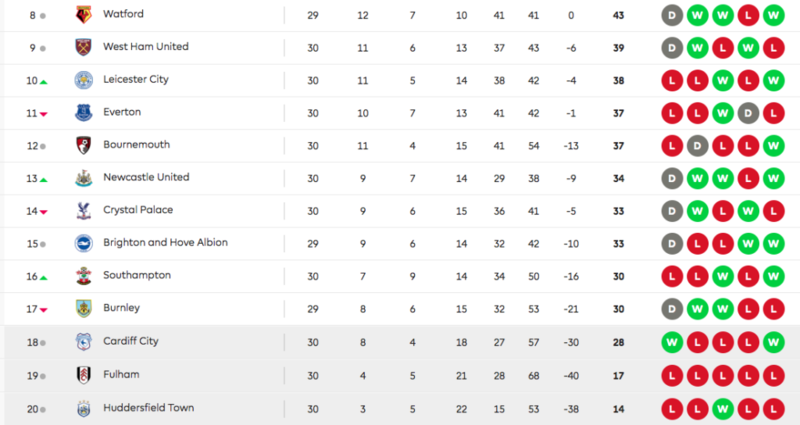 I think Brighton will be favourites for relegation next year. Glenn Murray is 35 and their main goal threat and every time I have seen them this year they have been OK at best. I have no idea how Hughton has got the points he has out of them. Mike Dean Ref on Saturday. Going for his 100th red card. I wonder which of our players he will give it to? I wonder what Pochetinno meant when he said to Dean “you know what you are”? I haven’t really seen much debate about it. Normally, people would be putting joke suggestions on what he meant on Twitter and the like. This may be a controversial opinion, but apart from his theatrics Mike Dean is by no means the worst Ref in the Premier League. He gets a lot of the big games and is therefore under scrutiny a lot. There is the argument he gives out too many red cards but the other Refs probably give out too few – especially if you are English and wear a Tottenham shirt. Or if you are England’s current goalie. It’s gonna rule Rondon out as well mate – wonder how that sits with Rafa?!. Great. More international fixtures coming up. That means Rondon, Almiron and Ki flying halfway around the world again. I think Muto retired. I looked at the England squad and there is a decent 1st team but not much depth, especially midfield. And then of course there is Pickford. Southgate is very lucky because there are some excellent young players coming through. It will give hope but we will never win anything under Southgate. As soon as he was tested against Croatia he was found out. But there’s really no other candidates – why he got the job in the 1st place. If we fail to sign Rondon permanently then Jabba has learned nowt. Arsenal and Chelsea probably favourites for the Europa League, even with Arsenal’s bad result. Shows what we are up against in the Premier League. And now you have Real, Bayern, Chelsea and probably PSG on a rebuild. It will make the competition for the top players even more fierce. What that has done recently is drag prices upwards for the not so talented players. For the players we are interested in. Where a 10 million pound player is suddenly touted for 20 million. Think Tom Cairney at Fulham and many, many more. Michael Owen predicts a draw on Saturday. Maybe I am wrong but he seems to predict a draw most weeks that we do not play the top 6. However, he did point out we have only gotten 2 of the last 18 points in away games. Are we due? I would say that we have more chance at Bournemouth than Arsenal and previously we had been playing better away from home than at home. Bournemouth are a fragile team. They can play in pretty patterns but crack if things turn against them. So, for a 3rd week in a row I am going for a NUFC win (by 2-1). I have seen the headlines on Brexit but followed the initial referendum more closely. That got me thinking. Has there ever been a person whose face fit their personality more than Nigel Farage? It just screams arrogant t@sser. Maybe equaled by Trump? It always seemed strange to me that you would ask a gambling addict to make the Premier League predictions. Like putting a bottle of vodka on the table at breakfast every morning for an alcoholic and expecting them to abstain. I hope Merse can get it back together again. If you ever read Merson’s predictions he was asked to go through each game and write a few paragraphs explaining his thoughts and scores. It was all a bit of a lark to the producers I am sure because he was a bit of a figure of fun. But he was being asked to write his own form book for the games. Yes, a gambling addict being asked to write a form book every week – what could go wrong? BTW: I never had a problem with Merse and hope he gets help. I called him Paul Merson’s Giant Balloon Heed because he has got a giant balloon heed and it reminded me of when kids would draw a face on a balloon with a marker. FYI: Atlanta are struggling in MLS. Maybe expectations were too high and Frank DeBoer has replaced Tata Martinez. But there may be another reason – Almiron – who basically ran the team. There is an article in The Guardian about it. Having Shola as a pundit makes a change from these fckin Cockerneys and Scousers. Agree with that Ice. It’s precisely what I’ve always thought. Atsu’s the same. Full of talent and skill but without the belief or bottle to do it. Has there ever been a bigger mess than the Brexit vote? It shows you what Tw@ts you end up with when you let the local parties select soft candidates and then the electorate just vote along party/north-south lines. Ice – I held off this one to see if there was some kind of personal issue that caused him to leave. But so far, Oldham have said that he left without speaking with them first and told them by TEXT MESSAGE – classy lad. Another one who sat in the BT Sports studio and slaughtered the likes of Jose in particular – then lasts 30 days!!. I think Oldham have been very classy about how they have dealt with it initially. I think they would be perfectly justified in suing him for breach of contract. They would have went through a rigorous recruitment process and hired Scholes believing he was committed to the cause. Yes it’s a risk taking on an untested newbie, but for him to throw the towel in after a month is a joke – and will have a huge effect on their season. Sharpy: Scholes is moaning that he was led down the garden path by the owner and that Oldham was a shambles. I guess that is why they needed him there tofix it then? I was also trying to think of the word to describe what all of these pundits do. It is SOPHISTRY – making a plausible but wrong argument. I was going to go on a rant about it but I will save it for the international break. Eric – they are a mid table league 2 side, I’m not sure what Scholes was expecting. I wonder if Ole has been told he’s got the Man Utd job and he’s offered Scholes a place on his team. Regardless, to leave by text without any explanation is classless imo. The draw has pretty much assured the Champions League semi-finalists. Is it fixed? Its setting up for Messi vs Ronaldo in the final. If they keep Barca and Juve apart in the semis I really will believe it is fixed. Now they have drawn the potential semi-finals and have kept Juve and Barca apart there. Even though the fix is in, it would be great to see a Messi-Ronaldo final. There is no guarantee of top 4 this year which is essential to pay for that stadium/spaceship. Their transfer targets are said to be Grealish, Jarred Bowen of Hull and Carlos Soler of Valencia. Zaha was once a target and is now deemed too expensive. And the way the draw has worked out it is likely Barca against Juve or City in the final. So Messi vs Pep or Ronaldo. And you are telling me this isn’t fixed!!! Before we get rid of Roberts give him some first team time ahead of Atsu then decide. I still think there is talent there to be encouraged. What with the Champions League and Europa League draw and this being FA Cup weekend I almost forgot that Sunderland are in the final of the Checkatrade Trophy. Nigel Farage is also leading a march from Sunderland to London in support of Brexit. If the Europeans get a look at the great unwashed they will bring article 50 date forward rather than delay it. Rafa’s already made his mind up on Roberts and that’s it. Surprised it’s on a free though as he’s a talented kid. Muto, Yedlin, Ki and Kenedy give us a strong bench. Looking forward to this one (famous last words!) I think Nelson said that before Trafalgar. Or, since it is the Ides of March maybe Julius Caesar said it on his way to the forum? Eric – don’t think it will be far off that 11 mate (only Dummett I doubt). But I think he’ll stick with 3 CBs and Ritchie at LWB – to start with – he may switch to 4-2-3-1 within the 90 mins.